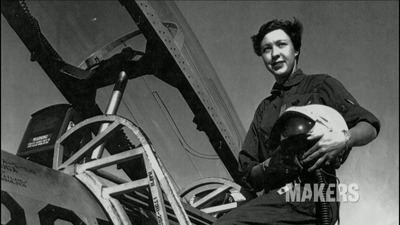 Public DomainAward-winning pilot, Geraldyn ‘Jerrie’ Cobb who trained to become an astronaut but never flew to space. Space is a hard enough place to get to from a technological stand point without American propaganda working against you. During the early 1960s, both men and women underwent the arduous and, at times, bizarre training program to have the chance to be some of the first NASA astronauts in history. 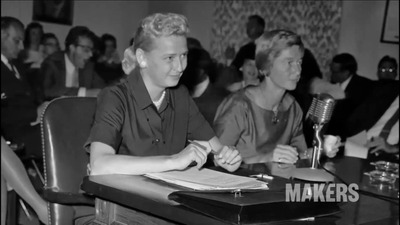 When the training was over, many of the women finalists had higher scores than the men but instead of going to space, they were completely excluded from the final selection pool. American women would remain grounded on US soil for another 30 years until 1983, when Sally Ride became the first American woman in space. Here is the heart-breaking story of the women who were meant to be some of the first astronauts in space but were left on Earth. Their outstanding achievements, pioneering efforts, and struggles are detailed in the PBS documentary “MAKERS: Women in Space“, which is the third film in a series of six documentaries about women pioneers. From the very beginning, engineers speculated that women would make ideal astronauts because they are generally smaller, lighter, and eat less than men. Magazine cover of February 1960. 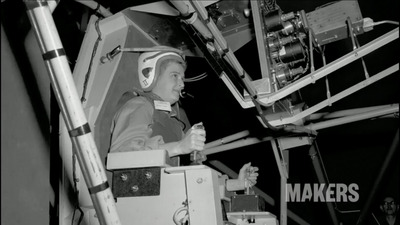 Economically speaking, less weight in the cockpit meant less fuel needed to launch the rocket into space and a cheaper trip with women astronauts. 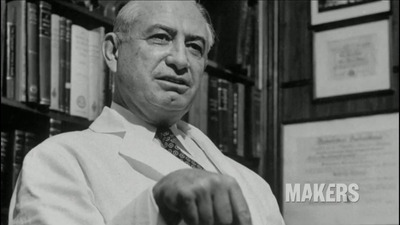 In 1958, the physician William Randolph Lovelace helped design and conduct a series of tests to select the first astronauts of the Mercury Program. The final group, called the Mercury Seven, was established in 1959 and consisted of seven men who were test pilots in the Navy or Air Force. 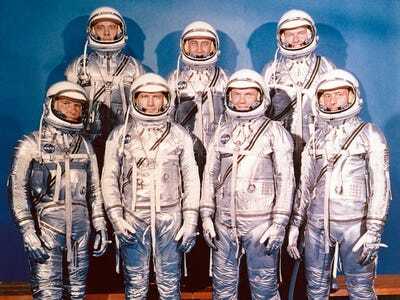 The Mercury Seven in 1960. Back row: Shepard, Grissom, Cooper; front row: Schirra, Slayton, Glenn, Carpenter. This was the only time they would appear together in pressure suits. (1) Slayton and Glenn are wearing spray-painted work boots. That same year, when the Mercury Program was established, Lovelace developed a private program of his own that tested women pilots. NASA did not sponsor the program. But because the Navy and Air Force did not allow women pilots at that time, Lovelace had to look elsewhere for his candidates. Wally Funk, one of the women Lovelace tested in his program. 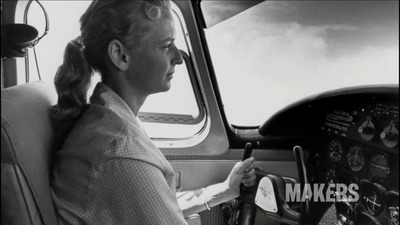 The first woman Lovelace invited was award-winning pilot Geraldyn Cobb who, in 1959 and 1960, set a total of three world aviation records. Jerrie Cobb in the center. 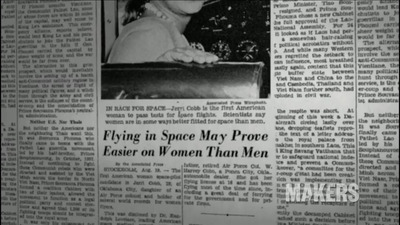 Cobb passed all three phases of Lovelace's tests -- the exact same tests the Mercury astronauts had completed, proving women were as capable as men to fly in space. 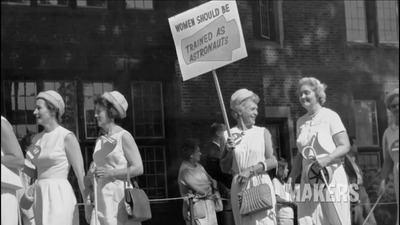 A woman with a picket sign supporting women astronauts. After that, Lovelace and Cobb together recruited 19 more women pilots to undergo the same tests. 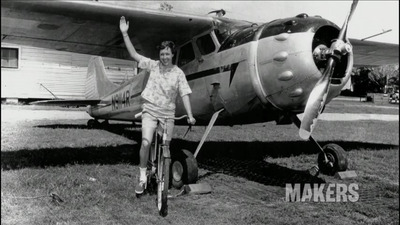 Each woman had at least 1,000 hours of flight experience. Photo taken in 1995 of 7 of the Mercury 13 team. From left: Gene Nora Jessen, Wally Funk, Jerrie Cobb, Jerri Truhill, Sarah Rutley, Myrtle Cagle and Bernice Steadman. 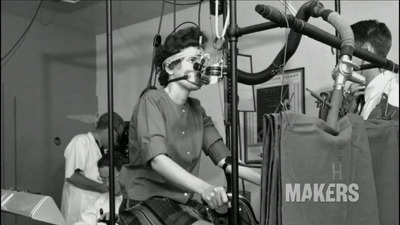 The tests were exhausting and at times brutal. Since no one knew what zero gravity would do to the human body, Lovelace tested everything he could think of. Jerrie Cob being electrocuted during testing. 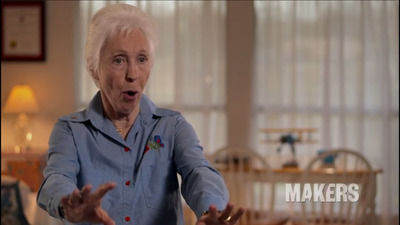 One woman, Wally Funk, remembers the most painful test being when ice water was shot into her ear for 20 seconds, which temporarily froze the inner ear inducing a feeling of vertigo. Wall Funk during MAKERS interview. Funk describes how her eyes began shaking along with the rest of her body. The test was to determine how quickly subjects could regain control. Another test used what's called a sensory deprivation tank. Subjects floated in a tank in a dark room for as long as they could before feeling uncomfortable or claustrophobic or starting to hallucinate. 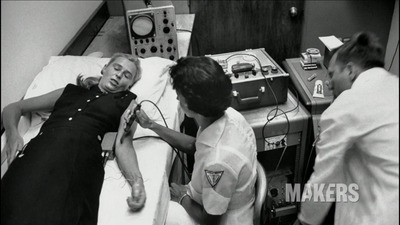 Wally Funk during testing in isolation tank. 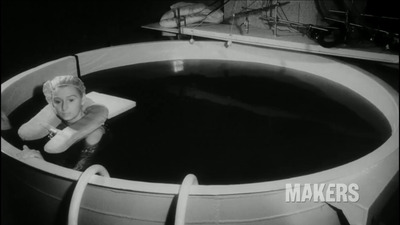 Funk remained in the isolation tank for 10 hours and 35 minutes, longer than any other man or woman. 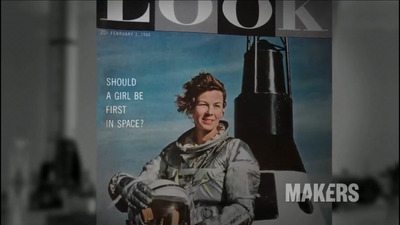 She was one of the final 13 women who passed Lovelace's tests and were qualified to go into space. Wally Funk in isolation tank. Many of the final 13 women, who were later called the Mercury 13, had higher scores than the men. Funk scored higher than NASA astronaut John Glenn. 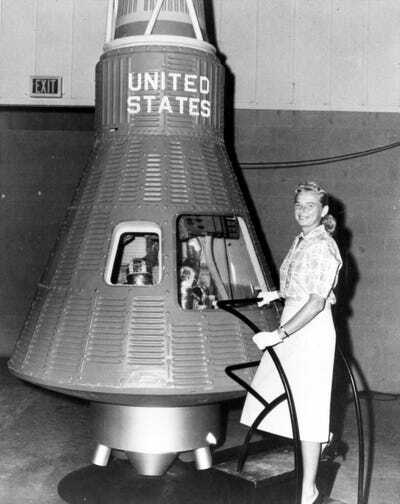 But no one from Mercury 13 ever went to space because President Eisenhower insisted that astronauts be military test pilots, and women were not allowed to hold that position in the military at the time. 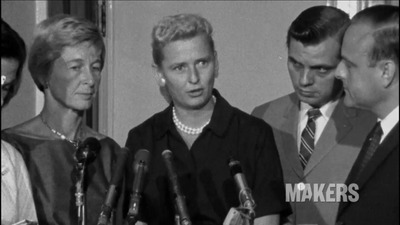 Cobb and other women of the Mercury 13 took their case to Congress. Because their tests were completed under a program that was not officially associated with NASA, however, Congress would not support their request to allow women into the NASA astronaut program. 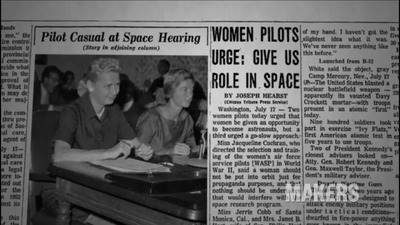 Cobb on the left with another woman of the Mercury 13, Janey Hart, at a meeting fighting for women astronauts. 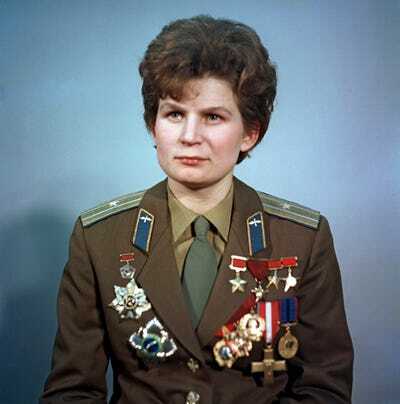 That same year, Russia sent the first woman into space, Valentina Tereshkova. When NASA finally admitted women into their astronaut program in 1978, the fresh batch of 35 recruits included six women and was called at the time 'The 35 New Guys.' Sally Ride was one of the six and became the first American woman in space in 1983. The women are outlined in red. 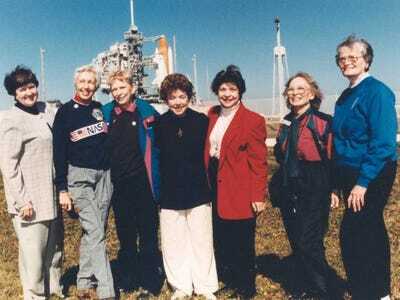 The six women of the team were Sally Ride, Kathryn Sullivan, Judith Resnik, Anna Fisher, Shannon Lucid, and Margaret Rhea Seddon. As of 2013, women represented 10% of all people who have flown to space. 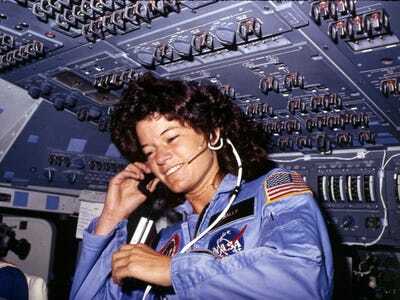 Sally Ride communicates with ground controllers from the flight deck during the six-day mission in Challenger, 1983. 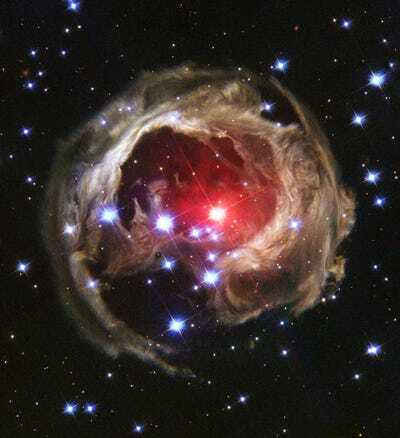 You've seen our struggles on Earth, how look at what we've accomplished in space.